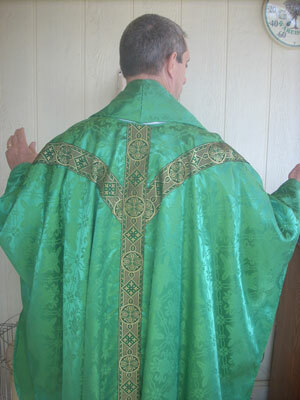 Custom made Gothic chasuble is available in your choice of red, green, white, purple or black from Everything Vestment. 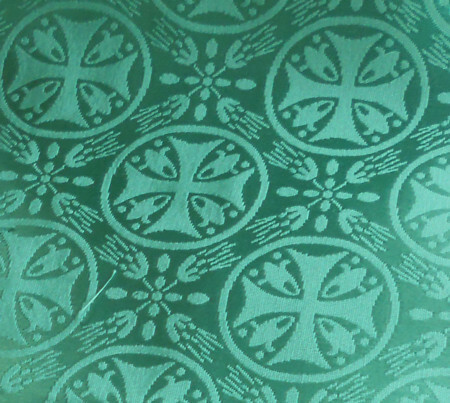 Our expert seamstress, Lynne Green will make your chasuble to your specifications. Please allow two weeks preparation before receiving your chasuble. A matching stole (also pictured) can also be ordered through Everything Vestment. When placing your order, please contact us regarding your preference for trim. 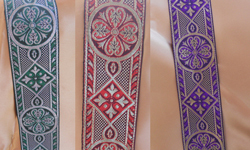 Our chasubles are fully lined and made with our fine quality vestment fabric. Our fabric is a rayon/cotton brocade of very fine quality and is available in your choice of red, green, white, and purple. The chasuble will be lined in matching satin. If you prefer a black chasuble, we can make that as well in our black cross vestment fabric. 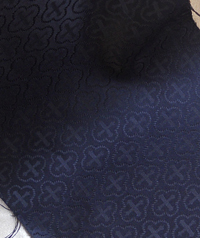 Our black fabric is pictured to the right. Our custom made gothic chasubles will have a matching trim of your choice. We can also often custom order trims to your specification. Just ask; we'll be happy to try to find the trim you want. The finished chasuble, size regular, is approximately 43 inches long, 54 inches wide, and fits most people. The plus-sized chasuble is 45 inches long and 58 inches wide. If you have a special size, just contact us. Also, please contact us and let us know what trim you would prefer. We have several trims to choose from, and you can see our selection of trims by clicking here. I received the chasuble yesterday and it is absolutely beautiful. Thank you and your mom so much for making this for me. I will probably need more in the way of vestments in the future.